I got this knife pretty long time ago and am now ready to do a review on it. The knife came directly from China and took a bit more than a month to arrive. 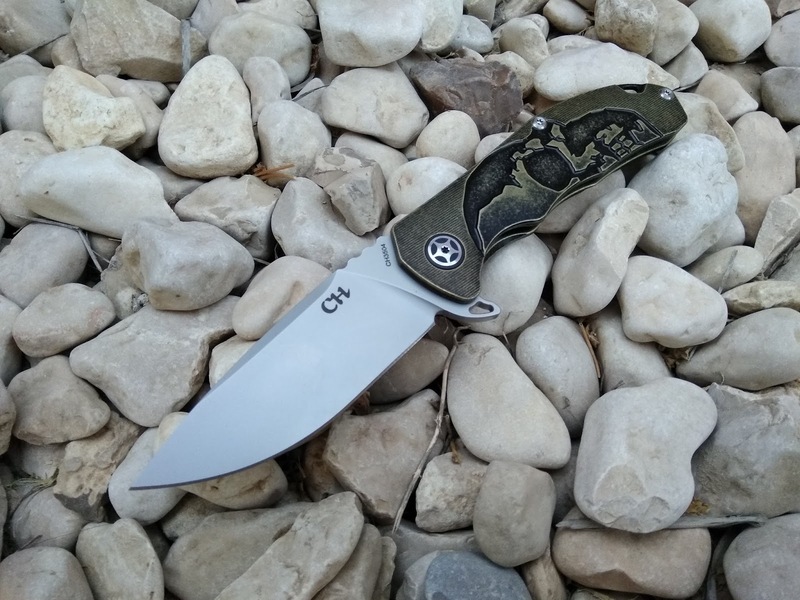 The CH3504 arrived in a CH Knives branded black cardboard presentation box. 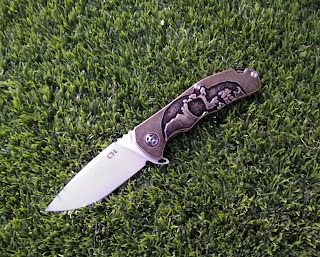 It had no issues out of the box - it was smooth, blade was centered, no fit & finish issues, had no bladeplay whatsoever, pretty early lockup and was razor sharp out of the box (shaved hair and cut paper without any effort). I did however take out the ti backspacer to have a better balance and an open construction. One thing is pretty important to mention - the finish on the blade was a much finer stonewash than what I've seen in other reviews. - The great original design. - Stunning looks - graphics and the black-gold finish. - Overall quality out of the box. - The little details, like the rubber o-rings that prevent accidental opening of the pivot screw. - Great ergos that will fit most hand sizes. - S35VN steel - haven't given me reasons to question it and has kept a great edge. - Price - an S35VN ti flipper with ceramic bearing for this price has amazing value. - The flipper tab functions well, but isn't the most comfortable one out there. - The pocket clip is pretty stiff. - I'm not the first to review this knife online but it was important for me to share my thoughts and experience with you guys. The knife is great and I'm glad I got it. Lately I am less and less drawn to clones and fakes (still glad I got those as I learned a lot about knives because of them) and more to the original designs that come out of China. BTW - I'm thinking to give this one away in my upcoming giveaway, please share in the comments if you would like to see this as a prize. Hope you could get one soon man! What's the weight of the knife now that you removed the backspacer...and were there standoffs (decorative?) inside or did you have to buy replacements on you own? It's 5.6 oz, not a huge difference but now the knife has better balance. There were standoffs inside, not decorative ones, but I don't really mind while the knife functions perfectly. I haven't had a chance to try any CH knives so a giveaway sounds great! Really appreciate the reviews, btw!